We had about 6 Charleston locals make it up to the Wrightsville Beach, NC "Surf to Sound Challenge" race. As the "press release" below mentions, conditions were tough, but a great day. Cool, but sunny. Very windy, choppy, and good sized surf. I read a few articles that quoted the winds gusting into the 20 knot range...was at least in the teens. The beach / surf start was humbling for most of us. Even with years of surfing experience under our collective belt, I think most of our crew had a bit of trouble getting through the 2 sets of breaks, some in the chest to shoulder high range. Doesn't sound too scary, but was certainly more tricky than expected when on a long race board, and with 50 fellow racers shoulder to shoulder with you. During the elite race, after getting through the surf, the fairly disorganized, windy chop in the open ocean was the next fun challenge - at least we had a nice wind at our backs. Most of us took a few swims -- it wasn't unusual to hear the splashing sound of nearby racers taking a plunge as well. Would have been pretty fun chop / swell / downwind conditions to navigate on a casual day. But, in the setting of trying to paddle fast and actually RACE at the same time, it was definitely a humbling experience. After rounding the jettys into Masonboro Inlet, the water became a bit more calm. There was a brief downwind, sheltered intracoastal creek stretch...much too brief. We then rounded a buoy and headed into a pretty stiff wind for about 3 miles up the channel toward the finish line. This was a brutal stretch - everyone pretty much just held their ground. Not much dualing or changing of places going on as we were grinding it out into the wind during that final, long leg. I did have one drafter within an inch of my tail for a good 2 miles or so -- hope he enjoyed my help! Wish he had returned the favor. Everyone did well. Most of us learned a lot. Joe Mosquera was the top Charleston-area finisher in the men's 14ft elite, finishing 7th. Jenny Alderman was the first Charleston-area woman to finish the elite, in 5th place. As has been the rule this year, these Wilmington/Wrightsville races bring with them great competition and strong paddlers. The overall winner was a former Canadian Olympic gold medalist in sprint canoeing, Larry Cain. Please see the press release below for some more details...full results can be seen on www.distressedmullet.com. NC Surf to Sound Challenge "exceeds expectations"
Wrightsville Beach NC...Stand Up Paddleboard competitors from three nations, ten states and the District of Columbia, enjoyed sunny skies and temperatures in the 60's for today's inaugural NC Surf to Sound Challenge. Shawn Spencer, Race Chairman, said: "Today's North Carolina Surf to Sound Challenge exceeded all expectations. Over 107 racers joined us today in this benefit FOR Masonboro Island." However, Northeast winds were strong at 10-15 knots, and the surf was rough for the ocean start. Seas were three feet, increasing the challenge for the elite athletes. 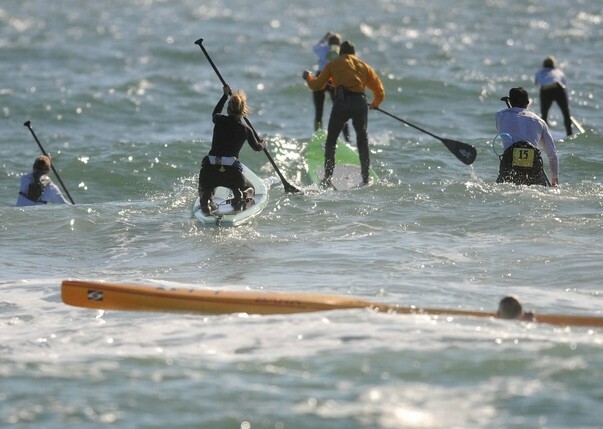 Elite paddlers navigated a 6.5 mile course, with a Le Mans style beach start, running to pick up their boards and splashing into the frequent and heavier than usual surf. Once getting past the breaking surf, the elite athletes braved the open Atlantic Ocean, battled through Masonboro Inlet, and paddled the channel behind Masonboro and Wrightsville into a stiff wind before reaching the finish line. Intermediate paddlers crowned their champion on a 4 mile flatwater course, the popular Harbor Island Outer Loop. While conditions were more serene than the elite course, racers faced stiff winds, tide changes and intense competition as they navigated the wide water circle around Harbor Island and the now famous Loop. The youth competition fielded 8 paddleboarders who braved the cold air and 63 degree water at 9am to complete a 200 yard dash, rounding a buoy at the half way mark. The North Carolina Surf to Sound Challenge was organized by the Wrightsville Beach Paddleboard Club and Blockade Runner Beach Resort. WBPC spokesman Haywood Newkirk said today: "We are really excited about being part of the season ending fall race here at Wrightsville Beach. Having the event at this location will allow us to have a more challenging ocean start for the Elite Race, while simultaneously holding an enjoyable flatwater race for the recreational paddlers that are so important for the growth of this sport." 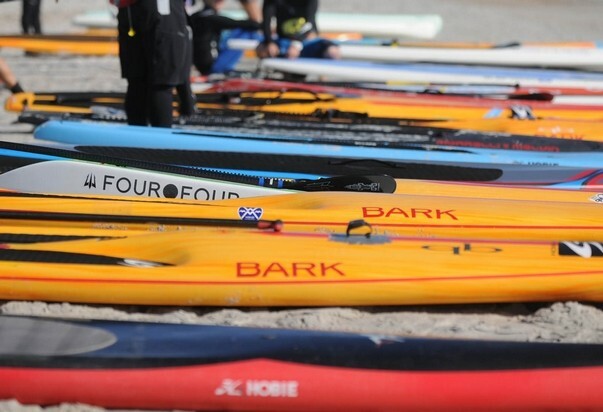 William Pope, Director for the World Paddle Association said: "It has been amazing to watch how quickly the stand up paddleboard (SUP) sport has grown throughout the country, especially in the Wrightsville Beach area. Wrightsville offers so many different types of water and conditions it appeals to everyone. As the SUP community continues to grow around the world, Wrightsville Beach will be at the heart of that growth on the East Coast." The Surf to Sound Challenge was sanctioned by the WPA (World Paddle Association).